A cute bunny with great big floppy ears and an adorable knitted dress. Pink fabric detail on the paws, feet and ears and the dress is removable so children can dress and undress her. 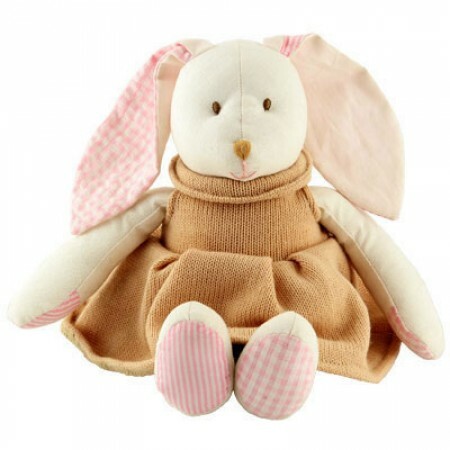 A really lovely soft toy that children are sure to love. These rag dolls by Imajo are hand made in Sri Lanka. They are made in a factory which operates a fair trade policy, workers recieve a fair wage and many other additional benefits. Holidays are paid as well as religious and bank holidays and female workers recieve maternity pay and their jobs a open for when they return. The materials are bought in the local area supporting the community. Generally good all round really!